Hi everyone Pam here. 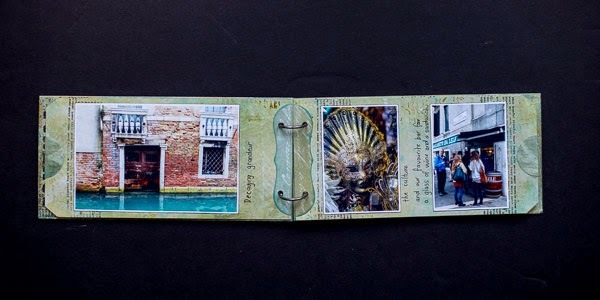 Today I'm going to show you a little travel mini album I made using PaperArtsy Large Manila tags. 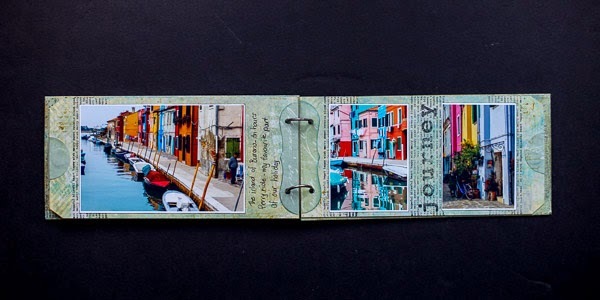 Mini albums are great for holiday photos, and the number 10 size Manila tags are the perfect size for photos and a little journalling. My photos are from our recent trip to wonderful Venice! 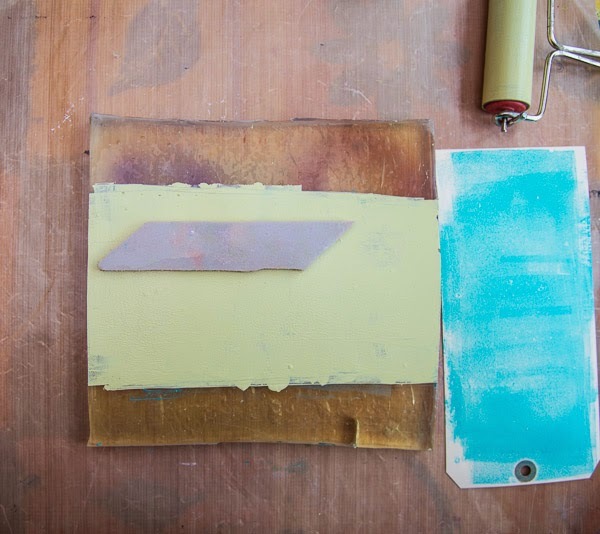 Firstly I'll show you how I added colour to the inner pages. 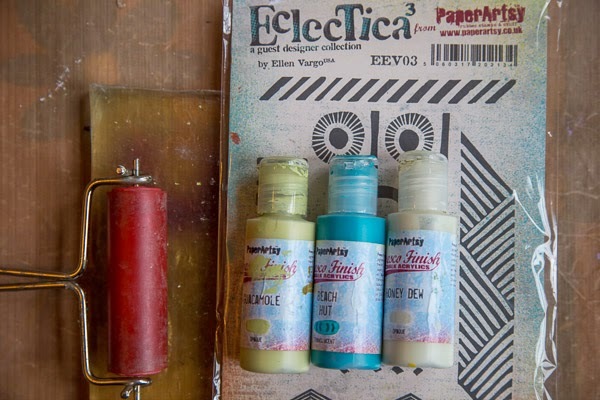 I used my home made gelli plate with Fresco Paints and Ellen Vargo Eclectica 3 stamps. What I was after was layers of colour and pattern reminiscent of the faded and crumbling facades of the Venetian buildings. 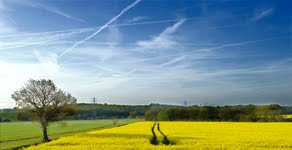 I wanted a fairly neutral colour palette, so as not to overwhelm the photos. 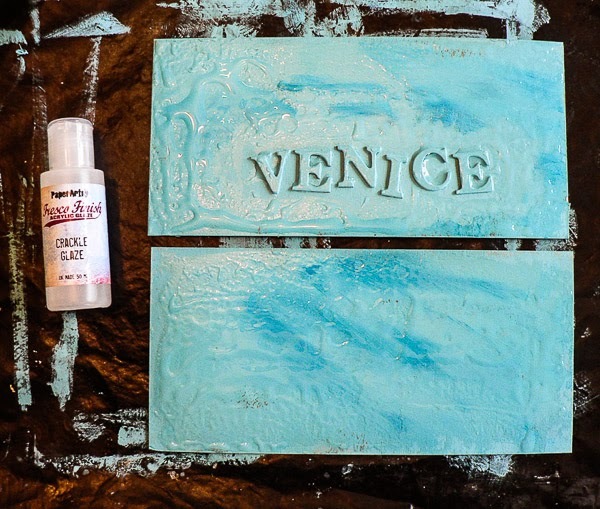 I started with a layer of brayered Beach Hut -the colour reminded me of the colour of the canals. 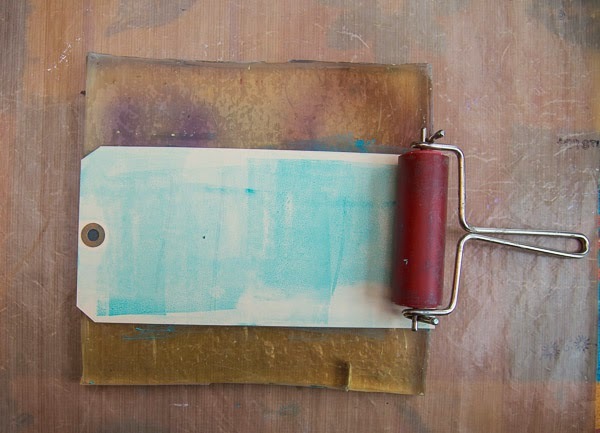 I pressed a tag into the paint, and also brayered the excess paint onto the back of the tag at the same time. There is no right or wrong way to layer the colours and patterns on-I was just after random marks and texture. 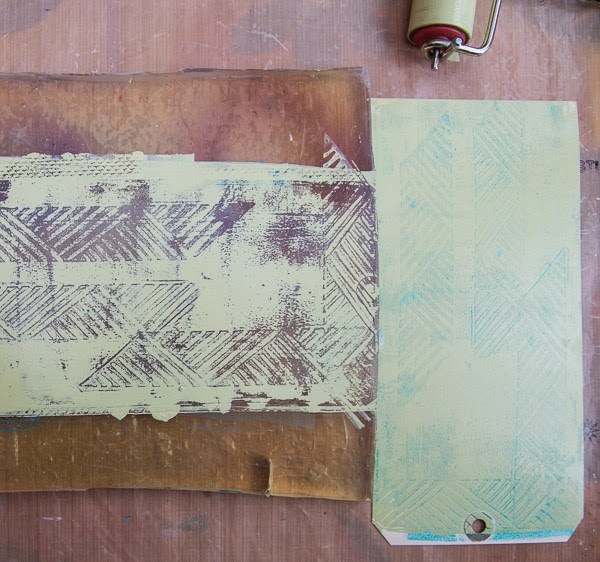 I then brayered a layer of Guacamole, then pressed the diagonal line stamp into the wet paint, in a few places. I stamped the excess paint off onto one side of the tag. 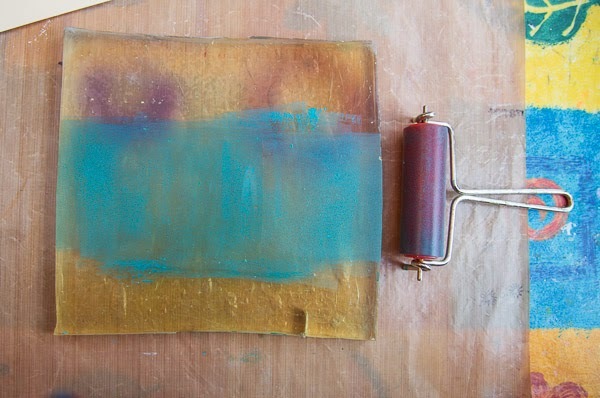 I took a print off the Gelli Plate. 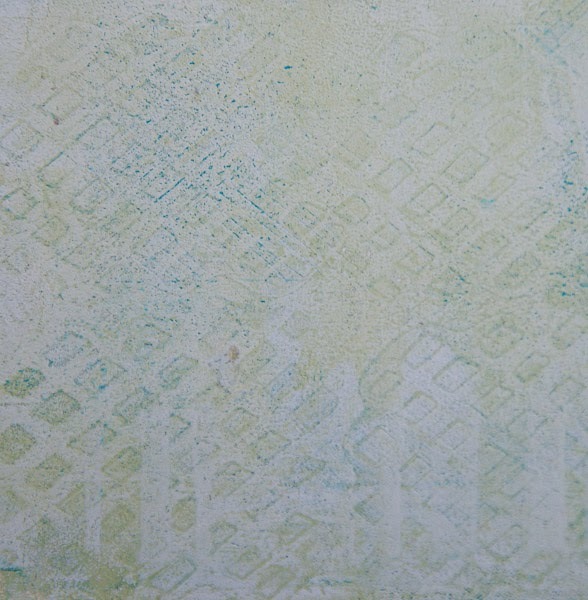 I brayered on a layer of Honey Dew, and stamped into the wet paint with the diamond stamp, then took a print. Here's a close up of the tag-remember the pattern and texture can be quite random-every page was a bit different. Now I'll show you how I made the cover. I used grey chipboard for the covers, just to make the album a bit more durable. 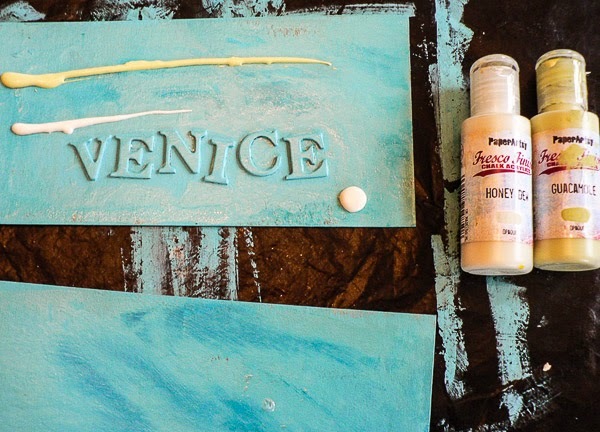 First off, I adhered some chipboard letters and painted the whole cover in Bora Bora . When that was dry I covered it with Crackle Glaze, and let that dry. Then I painted it over with a mixture of Honey Dew and Guacamole. Next I watched the cracks magically appear. 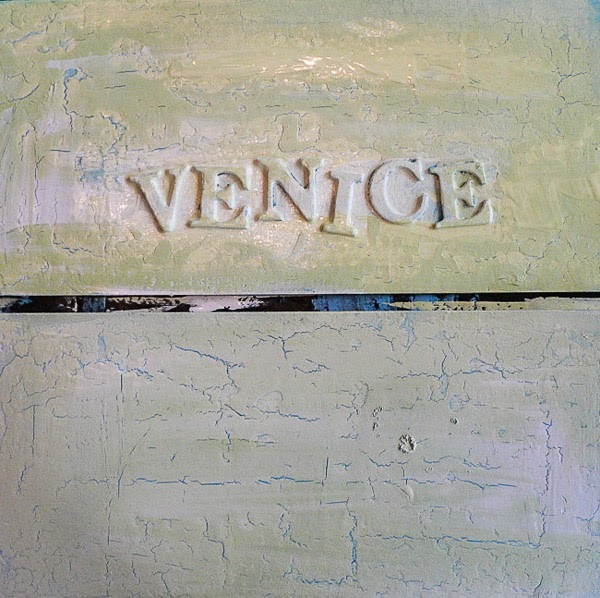 I have to say that over the years I've used all kinds of crackle glaze-and none of them are half as good as this PaperArtsy one in my opinion!! I then applied some Treasure Gold on the letters-first some Spanish Topaz, then some Sapphire over that. I also rubbed some Treasure Gold into the edges of the cover to give a vignette effect. 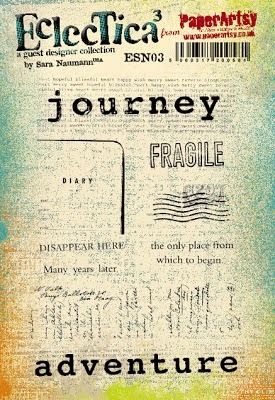 To complete the cover I used the Journey stamp from the ESN03 set. I cut out the image and matted it onto some Chatsworth Paper, attaching it with a pair of brads, before adhering it to the cover. I also used a set of small alphabet stamps to stamp the word 'around'. I cut the bracket detail from Chatsworth Papers using a Spellbinders Label die. I was initially going to use one book ring though the tag hole, but decided the album would be a bit more stable if if used two book rings instead. I used my cropodile to punch the holes for the book rings. 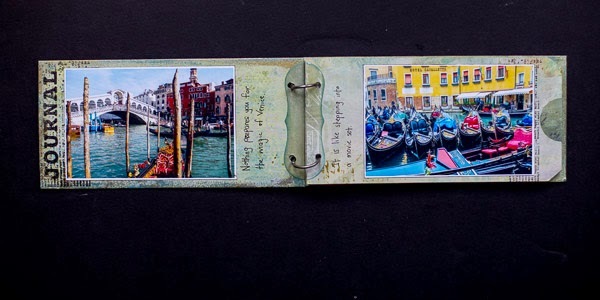 Having finished the cover and laid down colour on the tags, all that was left was to add one or two details, adhere the photos, add some journalling and assemble the album. 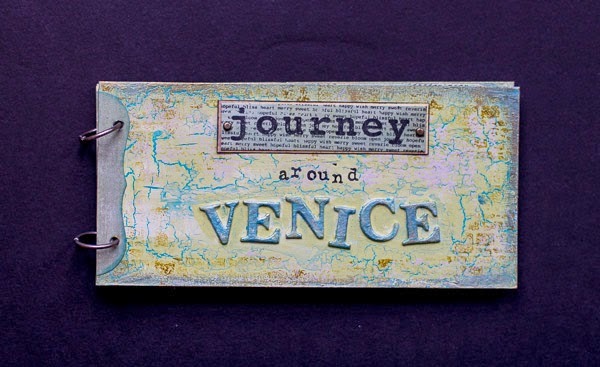 On each of the pages I stamped the journey stamp across the page, and added the bracket die cut to the centre. These details, and the colour palette, visually connects the inner pages to the cover. I covered the tag hole with a punched and folded circle of Chatsworth Paper. 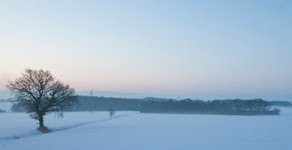 I hope you enjoyed my process for using tags to create a simple mini album to showcase a connected series of photos. 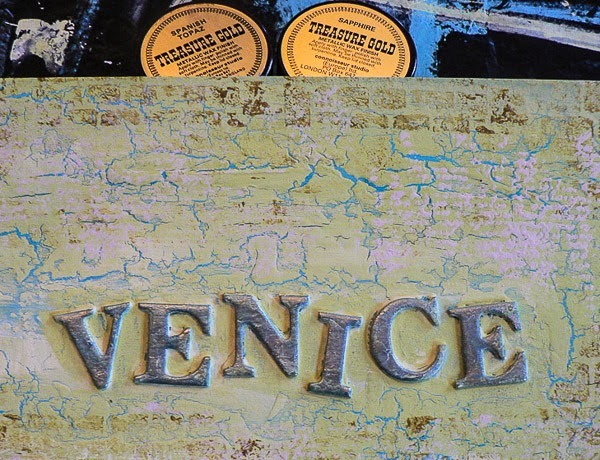 Leandra Says: OMG, well jell of your Venice Trip, I know 3 families who have been recently! The Gellie Plate texture is so nice on that background, and everyone love a mini album to flick through! 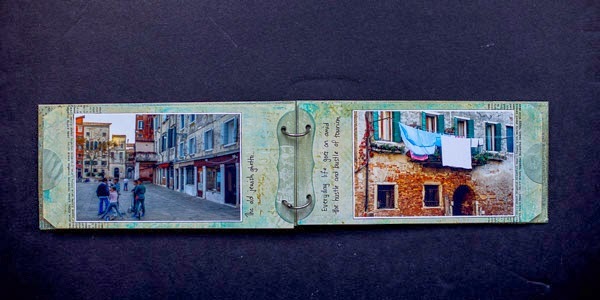 Gillian Says: What a wonderful and simple solution to housing those sentimental pics. 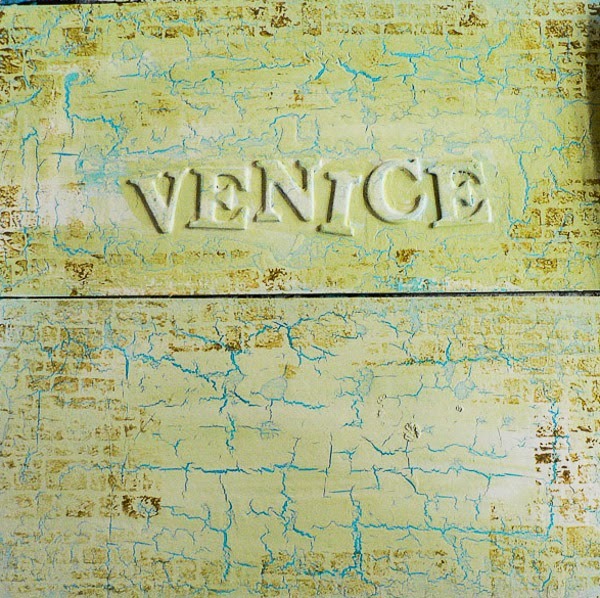 The crackle glaze and colour como depict your trip to Venice beautifully. If you would like to join in this week's challenge and play along with Pam's techniques, then do link up your creativity here, and go in the draw to win some PA stamps of your choice! You need to link your entry by 17:00, Sunday April 27th 2014. This is beautiful, Pam, what a fabulous way to store your memories. 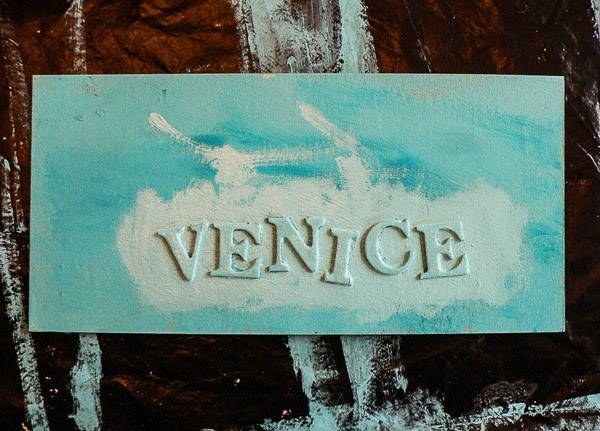 SO jealous that you've been to Venice! Your mini album is wonderful, fantastic effects & textures from the Gelli plate & the covers are gorgeous. 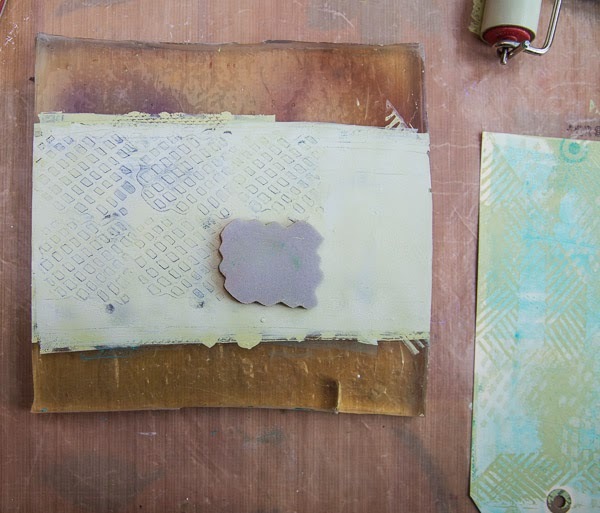 Gorgeous, I have just dared get my gelli plate out of its packaging for the first time this weekend so your projects are giving me inspiration to try things out. Wonderful memories kept in an amazing album. Love this mini album. The colours are striking and it was great seeing how you created those different layers! Wonderful tutorial Pam, I was inspired to create one for this challenge.